Cook broccoli and tortellini as directed on bags. Drain; place in large serving bowl. Meanwhile, in 1-quart saucepan, heat pasta sauce over low heat, stirring occasionally. Pour sauce over broccoli and tortellini; toss to coat. Sprinkle with Parmesan cheese. A mixed-greens salad along with crusty rolls make tasty pasta partners. 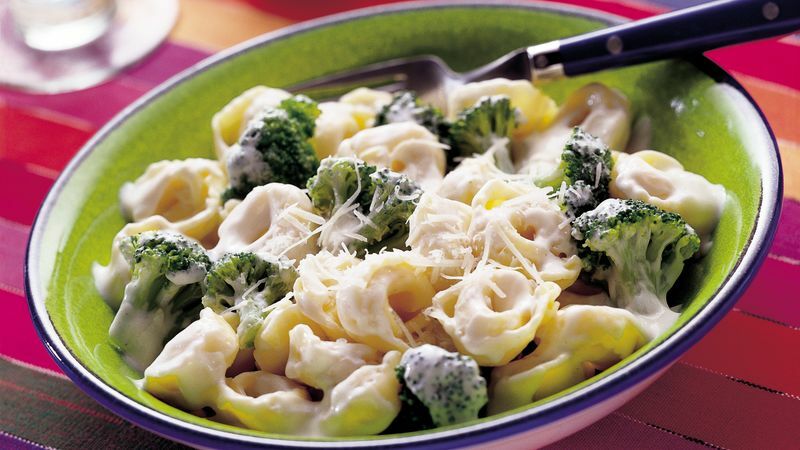 This Broccoli and Tortellini Alfredo recipe is one of the easiest pastas you’ll ever make. It takes just 20 minutes, four ingredients and three steps to get dinner on the table. And don’t let that short ingredient list fool you, the combination of cheese-stuffed tortellini, broccoli and cheese makes for a flavorful dish that will definitely fill you up. Got a picky eater to please or need a few more options? Don’t worry, Betty’s got plenty more tortellini recipes for you to explore, plus tips for buying, storing and cooking pasta.